Click through to see the full sized version, and a popup bubble comment from the author. 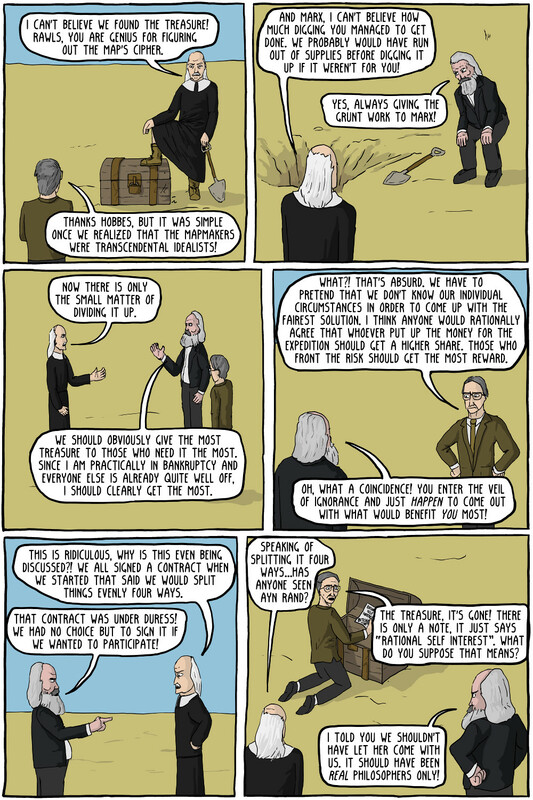 via Buried Treasure – Existential Comics. If you don’t know much about these guys, Marx wants to divide up in the communist manner, Rawls wants you to evaluate societal rules as if you don’t know what your role in society will be (i.e. rich, poor, etc), Hobbes wants to talk about the social contract you agreed to by being a member of that society, and Rand basically just wants everyone to look out for themselves. This entry was posted in Zeitgeist and tagged Economics, Existential Comics, Philosophy, Web comic. Bookmark the permalink. Haha…I think John Galt made off with the treasure. Who the hell is he anyways? I couldn’t get past the first paragraph. But I did manage to finish the movie, and John Galt just turns out to be a guy, an individualist. I was hoping he was no one at all, or something more mysterious…like the Wizard of Oz. But no. Just some bloke. I guess you could give him some god-like characteristics if you wanted to be generous, but I don’t want to be generous, not to Ayn Rand. John Rawls specifically stated that his ethical theory would put knowledge about the general world in front of the veil, so Marx’s complaint about wealth inequality would be known. What I am saying is that Rawls would not have necessarily disagreed with Marx on that presumption. Good point. It could be argued that not knowing where you would be in the world would incline many people toward a more egalitarian system. The problem with any discussion like this is that it assumes that “wealth” is a pile of money sitting in a chest and the question is how to divide it. Wealth is nothing of the kind. I wouldn’t read too much into the treasure chest metaphor. But it does nicely work in the conflict between the workers (Marx) and investors (Rawls).